First of all, let me just say that Rune Dice are not a historical artifact. They are modern inventions, and there are numerous permutations and ways of using them, so I encourage you to research and develop a method that works well for you. This page explains how I set up the configuration of my dice, to help you understand how they might be used in your own practice. Each die is inscribed with six runes. Each die loosely contains one of six areas of concern: Boon, Challenge, Action, Time, Race, and Luck. This equals four runes of each area. 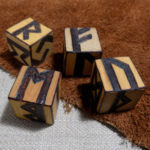 I experimented with many different configurations for each Rune Dice set, and I found that other sets tend to double-up meanings, or throw nonsensical readings fairly often. My final arrangement helped balance out the readings and made more sense as far as randomizing the runes you could roll with the dice. It also allows for grouping runes for a stronger reading dealing specifically with an area of concern. 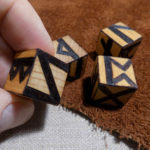 The dice are designed so that you can throw a single die for a simple reading, or throw all four for a more in-depth one. I have also seen other readers throw sets of dice in multiple succession for longer, more detailed insights. How you use them will be determined by the meanings you attribute to each rune, and how many runes you typically use in a reading. 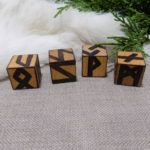 The four Races detailed by the runes are Humans, Gods, Giants, and Norns – representing the mundane, the Divine, the elements, and fate, respectively. Luck encompasses everything from spiritual health to the power of the Ancestors in influencing a current state. To the ancient Norse, luck was an important aspect of a clan’s soul and power in the world. I consider luck in these readings to be a persistent condition of the clan, tribe, or kinship as a whole. Some luck builds through successive generations of kin, whereas other forms of luck are tied to the associations a person makes through friends or business.